“Charging Bull” vs. “Fearless Girl”: Could the Battle Move to Court? 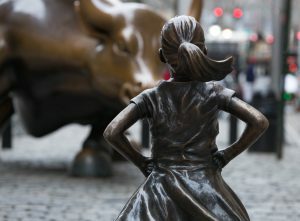 The “Fearless Girl” is a statue of a little girl standing, as the name would suggest, fearlessly before the iconic “Charging Bull” of Wall Street. Just recently installed, it sends a powerful message about the power of women in leadership. However, the sculptor of “Charging Bull” is not so happy about it. The sculptor of the bull, Arturo Di Modica, is furious over the addition of the statue. He says that it totally alters the message of his original statue. While Mr. Modica says he supports gender equality and what the “Fearless Girl” stands for. He says he always considered the bull-made and put on Wall Street in the 80’s after the stock market crashes-to represent peace. Mr. Modica believes that the endless faceoff between the bull and the girl ruins the message-turning the bull into a threat against the “Fearless Girl.” He’s considered turning the bull to face away from the “Fearless Girl” but has not yet done so, implying that he either would sooner have the “Fearless Girl” moved or his agreement with the city does not allow him to move the bull. While there’s no lawsuit right now, Mr. Modica’s attorneys have been clear that if they can’t reach an agreement with the city they will be happy to sue. So what exactly would such a lawsuit allege? Mr. Modica’s attorneys have already been arguing that his intellectual property rights will allow him to see the “Fearless Girl” moved. However, the case also raises an interesting issue of how moral rights are handled here as opposed to abroad. Fearless Girl a Derivative Work? Mr. Modica has copyright and trademark protection on the “Charging Bull”-protecting his rights in his work. What’s more, his attorneys have already said how they might assert those rights-they’ve called the “Fearless Girl” derivative. In the art world, this may simply be a mortal insult. However, in intellectual property law it is a precursor to a copyright infringement claim. When you possess the copyright in a work, that copyright provides you a bundle of rights which-once registered-you can assert against an infringer in a lawsuit. One of these rights is the exclusive right to make derivative works. In a way, that’s true. Is the “Fearless Girl” fearless is she isn’t staring down Mr. Modica’s bull? It could easily be said that the “Fearless Girl” incorporates the entirety of Mr. Modica’s sculpture into itself as part of its standoff. If the was the end of the discussion, Mr. Modica would be in luck-among the remedies to copyright infringement is the ability to impound and/or destroy any infringing works. However, there is a big asterisk on the claims of Mr. Modica’s attorneys-the defense of fair use. Fair use provides a defense to certain limited, transformative uses of a copyrighted work. The defense is extremely fact specific, so much so as to make it nearly impossible to declare something fair use without knowing the exact circumstances of the particular use. In making the determination, courts balance four quite complicated factors: (1) the purpose and character of the use (was it commercial, educational, transformative? ); (2) the nature of the work (eg. fictional v. non-fictional); (3) how much of the work was used and how important was the part used; and (4) how the use effects the market for the copyrighted work. Here, “Fearless Girl” almost certainly substantially changes the meaning of the work-after all that’s what Mr. Modica is so upset about. It also creates new understanding of the work by casting what is often considered a symbol of capitalism in a more gendered light. On the other hand, it doesn’t really parody “Charging Bull,” although it could potentially be argued that it criticizes the bull as an aggressor in the standoff between the two works. Ultimately, while the arguments do seem to weigh in favor of “Fearless Girl” when it comes to fair use, you can never really be certain. Fair use often comes down to which judge and jury looks at the facts and there’s definitely an argument here for both sides-perhaps part of why Mr. Modica is preferring negotiation to litigation at this point. However, if fair use puts an infringement lawsuit out of reach for Mr. Modica, he’ll have to turn to a particularly rarely used area of U.S. intellectual property law-the moral rights of artists. Moral Rights of an Artist in the U.S. Turning to moral rights is something that Mr. Modica hasn’t discussed as of yet-probably because the U.S. just barely does them. While they are a big deal abroad and especially in Europe, the U.S. has barely any moral rights in a work of art at all-instead focusing on economic rights. In fact, we do so little that some have questioned whether what we have lives up to what we agree to in our international intellectual property treaties such as the Berne Agreement. What we do have, and what Mr. Modica would turn to is the Visual Artists Rights Act (VARA). VARA applies only to a very narrow subset of works including paintings, drawings, prints, sculptures and still photographs made for exhibition only where only one copy or a run of no more than 200 copies were made. California and New York expand these limitations slightly in state law versions of VARA. Either way, under VARA or its New York equivalent, the law would include the one of a kind sculpture “Charging Bull” and give Mr. Modica rights, separate from his copyright, which will last until his copyright expires 70 years after his death (if the bull had been made after 1990 the rights would expire upon Mr. Modica’s death). These protections allow him to, under VARA, (1) claim authorship, (2) prevent use of his name on something he didn’t make, (3) disclaim ownership of a work that his be changed, mutilated, or modified in a way that would damage his honor or reputation, or (4) prevent distortion, mutilation, or modification to the bull that would prejudice his honor or reputation. Under New York’s law, he can also prevent public display of the bull if it is altered, defaced, mutilated, or modified in a way that might damage his reputation. When a work is well known enough, like “Charging Bull” is, its author can also prohibit intentional or grossly negligent destruction of their work. VARA allows an artist to, along with money damages, seek an injunction or impoundment to prevent the violation of their rights. But, Congress placed a number of exceptions on VARA rights, among these is the fact that VARA rights are still limited by a successful fair use defense. What’s more, while VARA protects against destruction or alteration, it does not protect the ability of an author to continue creating. In other words, New York is under no obligation to let Mr. Modica move or alter his statue. Is Mr. Modica Out of Luck? It does seem that, unless he can overcome a fair use defense, Mr. Modica is a bit up a creek. However, although unlikey, there may be further rights Mr. Modica possesses through any contract agreement he made with the city when the bull was commissioned. Contracts can waive moral rights or expand an artist’s rights-although the rights can’t be given to somebody else. Generally, any waiver must be signed by the author and in writing to be valid. Thus, these waivers are common terms in contracts to purchase art. It seems more likely that any contract left Mr. Modica with less rather than more rights. We’ll have to see how this develops. However, at least for the meantime, it seems that the “Fearless Girl” is unlikely to be going anywhere.